SniffAir is an open-source wireless security framework which provides the ability to easily parse passively collected wireless data as well as launch sophisticated wireless attacks. SniffAir takes care of the hassle associated with managing large or multiple pcap files while thoroughly cross-examining and analyzing the traffic, looking for potential security flaws. Along with the prebuilt queries, SniffAir allows users to create custom queries for analyzing the wireless data stored in the backend SQL database. 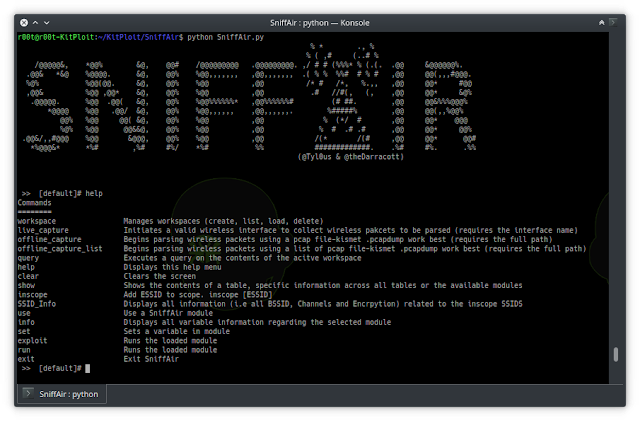 SniffAir is built on the concept of using these queries to extract data for wireless penetration test reports. The data can also be leveraged in setting up sophisticated wireless attacks included in SniffAir as modules. Tested and supported on Kali Linux, Debian and Ubuntu. /@@@@@&,    *@@%        &@,    @@#    /@@@@@@@@@   [email protected]@@@@@@@@. ,/ # # (%%%* % (.(. [email protected]@     &@@@@@@%. [email protected]@&   *&@    %@@@@. &@,    @@%    %@@,,,,,,,   ,@@,,,,,,,  . ( % %  %%#  # % #   ,@@     @@(,,,#@@@. Load data into a desired workplace from a pcap file using the command offline_capture <the full path to the pcap file>. To load a series of pcap files use the command offline_capture_list <the full path to the file containing the list of pcap name> (this file should contain the full patches to each pcap file). Use the live_capture <interface name> command to capture live wireless traffic using a wireless interface. The query command can be used to display a unique set of data based on the parememters specificed. The query command uses sql syntax. the inscope <SSID> command can be used to add a SSID to the inscope tables, loading all related data to the inscope_AP, inscope_proberequests and inscope_proberesponses tables. To view a summary of all inscope SSIDS run the SSID_Info command. Once all varibles are set, then execute the exploit or run command to run the desired attack. To export all information stored in a workspace’s tables using the Exporter module and setting the desired path.